From the coins of the Greeks and Romans to a status symbol of the Victorian Age, monograms have graced everything from linens to stationery to garden gates. 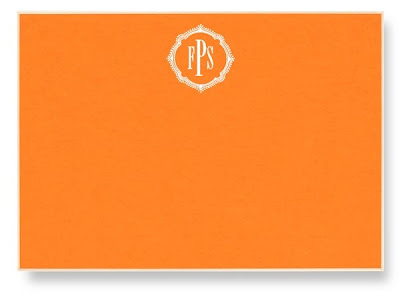 Our Vera Wang Orange Personalized Correspondence Card is stunning with an oyster white border & matching envelope. Add a patterned envelope liner for a dramatic effect. We love the monogrammed shams shown here in this magical toile bedroom created by talented New Orleans decorator Melissa Rufty and her MMR Interiors. The room is full of the sophisticated yet relaxed style that Melissa is known for. We think our correspondence cards would make the perfect accessory! 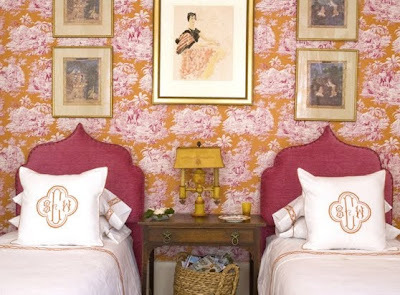 I'm a fan of anything with a monogram on it, and the pillows in the photo are wonderful!